Trained Fleas Perform Spectacular Circus Stunts As Seen Before and on top of the Crowned Heads of Europe. Improvised clown hijinx and spontaneous strolling performance featuring the Clown Laureate of Greenbelt, Maryland! A Punch and Judy election show! It's time to put a REAL Puppet in the White House! A play about a clown who really needs to quit. Features a miniature circus, the Acme De-Clownifier, and mediocre juggling. A series of classic tragedies performed by puppets. Shows currently include The Barbie Oedipus, A Short Days Journey Into Night, The Vegetable MacBeth, and The Tragic Goldfish . Original stories, poems, songs, skits, and gags about death, created and performed by your group! Meet P.T. 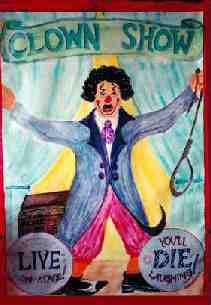 Barnum in a living history presentation of America's Greatest Showman. The Acme Clown Company presents original shows that amaze, educate, and entertain audiences of all ages. PLEASE, NO BIRTHDAY PARTIES! A fictional autobiographical story about a clown who needs to quit-- and can't. Through trial and tribulation, the clown wages an unsuccessful war on his own stupidity as he strives to find a cure for, ... well, himself. Buffoon Anonymous contains classic clown routines, addictive behavior, a circus ring, an obligatory avante-garde dance piece, the ACME DECLOWNIFIER, and mediocre juggling. 16' x 20' space, 9' ceiling. Basic lighting, 1 or 2 specials. The ideal touring space would have 100-200 seats in an intimate setting and be available for a 2-3 week run. There are a couple of risque references in this show, but nothing too outrageous Younger children probably won't be interested, because this is a play about a clown as much as it is a clown show. Using group theatre, instant writing, improvisational techniques and exercises culled from 10 years as an original theatre artist, the ensemble fleshes out the show's basic skeleton with their own original stories. (PARDON MY PUN) The show is written and built by the ensemble of actors. Personal, moving original theatre. The rehearsal process takes approximately 4 weeks of part time (approx. 20 hours per week) rehearsal. A PREVIOUS EXAMPLE SCRIPT IS AVAILABLE ON REQUEST. Minimal. This show can be performed using whatever resources the presenting organization has. Adults of all ages. Some of the material (due to its sensitive personal nature) may not be suitable for young children. Approximately 60 minutes, depending on the group. A selection of classic tragedies performed by puppets. Each of the pieces is between 1 and 15 minutes long and is suitable for adults or older children. PLEASE NOTE: This show is not approved IN ANY WAY by the Mattel Corporation. Eugene O'Neill's familial story told in an EXTREMELY ABRIDGED fashion. An abridged version of the Scottish play, using players from at least two of the four food groups. Duncan is played by an over-ripe tomato, and well, Scotland can get kind of messy... Out Out Damned Spot! A monologue/manifesto for a very eloquent goldfish. I prefer the title in French "Le Poissant Rouge Tragique"
Other shows are also being added. If you have a favorite tragedy that you'd like to see adapted for puppets, please email us! Adults and older children. Some of the material may not be suitable for very young children. Approximately 60 minutes, depending on the shows included, and the needs of the presenter. The Acme Clown Company is part of The New England States Touring program (NEST). If you are a presenter based in Massachusetts, Vermont, Connecticut, New Hampshire, or Maine, you are eligible to apply for NEST funding (UP TO 50% OFF!) to bring the Acme Clown Company to your theatre, school, campus, or club. If your organization is based in Rhode Island, you are eligible for this same funding through the RISCA touring arts program. To find out more about NEST, contact the New England Foundation of the Arts (NEFA) at (617) 951-0010 or at 330 Congress St., 6th Floor, Boston, MA 02210.